The yin-yang system is the best known Chinese philosophic tradition. You often hear people speak of someone's yin compared to someone else yang to denote a strange mixture of opposites. Yīn - yáng seeks balance between two alternatives: light/dark; hot/cold; sun/moon; male/female/; odd/even numbers; strong/weak; solid/broken;outside/inside; emit/absorb; active/passive; Imperial/barbarian. It seeks concord in all things, for example in cuisine where hot/cold and sweet/spicy flavors need careful combination. The iconic taiji representation is shown to the left with light ‘yin’ and dark ‘yang’ swirling around each other. It is also known as the 阴阳鱼图 yīn yáng yú tú yin-yang fish diagram with yin and yang as fish swimming around each other. Within yin is a little yang and within yang is a little yin illustrating their mutual dependence, yin can not exist without yang and yang without yin; they have to co-exist in balance and harmony. The curve gives the figure dynamism for this is not a static relationship, yin and yang change to each other. This same spiral pattern has been found on pottery made 4,000 years ago. There is both good & evil in both yin & yang, they do not appear in the pairs of alternatives because both yin and yang have their virtues and flaws – they represent alternatives not opposites. The clearest case is shown in the daily cycle of day and night. In Chinese the sun is named 太阳 tài yáng ‘great yang’ and so day is ‘yang’ and yet there are still places of shadow while yin (‘night’) still has the light of moon and stars. Soon the yang will change to yin and back again - as day and night are inseparable and interdependent. 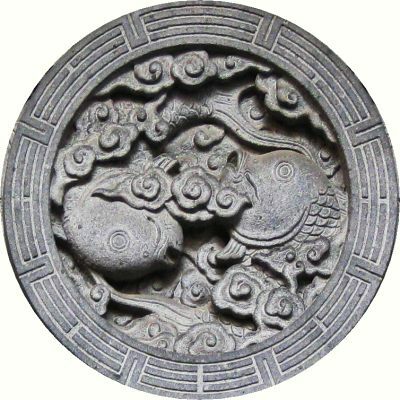 Surrounding the swirling yin and yang in the taiji figure are the eight trigrams (八卦 bā guà); these are all the eight combinations of the solid/broken stick central to Yi Jing. They are not arranged as opposites, they show the continuous cycle of change within yin and yang. For an explanation of the ordering and associations of the trigrams please see our Luo Shu (magic square) section. By looking at the transitions of yin and yang further sub-divisions can be made. And so the four seasons can be seen as winter (yin in yin); spring (yin changing to yang); summer (yang in yang) and autumn (yang changing to yin). An old legend for the origin of yin and yang has peoples separated by a river, the southern bank is shaded (yin) while the northern is sunny (yang). During Spring and Summer the two people met at great festivals to intermingle and intermarry. The character for yin 阴 yīn includes 月 moon and the character for yang 阳 yáng includes 日 sun, they both have the radical for ‘hill’. Note this is less clear in the old traditional characters where yin is 陰 – the right side has the elements ‘now’ and ‘cloud’ suggesting cloudiness and yang is 陽 – has the elements ‘sun’ and ‘rays’ suggesting sunshine hence darkness and light rather than moon and sun; but the moon is also named 太陰 tài yīn ‘great yin’. According to one creation story the one gave birth to two (yin and yang) the heavy element sank to become ‘yin’ earth and the lighter element rose to become ‘yang’ heaven. It was believed that the different combinations of yin and yang could represent everything. From these two came the five elements and then from these everything else. Thunder and lightning are presumed to be the result of the violent mixture of yang and yin: heaven and earth. Considering the arguably ‘positive’ attributes of yang, especially ‘maleness’, it is surprising that the pair always puts yin first, it is always ‘yin & yang’ and never ‘yang & yin’. A table showing the generation of the bagua (eigth trigrams) from three stages of mixture of yin and yang. Illustration from an edition of 1599. It shows the process of generation and transformation of the 'Myriad Things' (wanwu) of the universe, from nothingness to being. 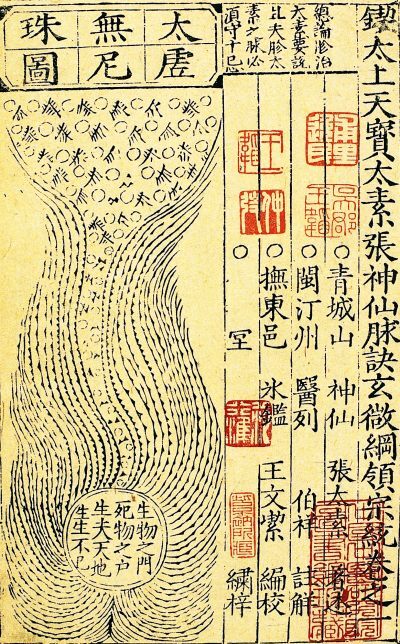 This process passes through the following stages: taiyi (Great Change), the primal state 'when clear and turbid are not yet differentiated'; taichu (Great Inchoate) when Yin and Yang come into being; taishi (Great Beginning) when Qi and form come into being; taisu (Great Purity) when heaven and earth are formed; and taiji(Great Extreme) when the Dao is formed. From taiji, Yin and Yang are generated; at the extreme degree of Yin, Yang is generated; at the extreme degree of Yang, Yin is generated. Through the unending process of generation and transformation of Yin and Yang, the cosmos and its 'Myriad Things" are formed. The yin-yang tradition is very ancient, it is mentioned in the earliest Chinese books so it is over two thousand years old and fis at the core of Daoist tradition together with the five Chinese elements, Feng shui, Yi Jing and Qi. In the Daoist tradition a harmonious balance between extremes is always sought. 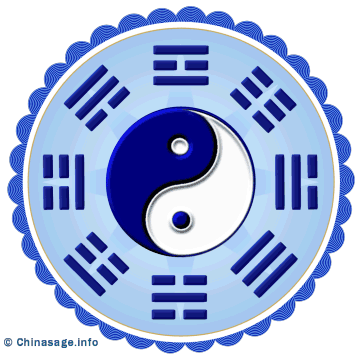 The Yi Jing (I Ching) takes all possible combinations of six yin/yang alternatives (two baguas) to develop a complex system that has been immensely influential; here the luckiest combination is neither all yin nor all yang but a harmonious intermingling of the two. The Emperor is considered the epitome of yang and the Empress yin. As nine is the most yang of numbers (all odd numbers are yang and as 9 is 3x3 it is an odd number of odd numbers) it is associated with the Emperor. Dragons represent the emperor and so naturally nine dragons is particularly potent. There are 'nine dragon screens' at the entrance to Imperial palaces and Kowloon in Hong Kong is the Cantonese for nine dragons. The Imperial capital – the Forbidden City – is said to have 9,999 rooms and the doors have nine rows of nine studs. Seeking balance between opposites has had huge influence on Chinese culture. It makes dogmatic opinions appear unbalanced, as an ingredient of the alternative view should always be accommodated. It was the root of problems when a new religion reached China that takes a dogmatic right or wrong position with no room blur and compromise. Mao Zedong's philosophical work ‘On Contradiction ➚’ can be seen as following on from the age old tradition of yin-yang. This idea is supported by the Confucian ‘Doctrine of the Mean’ where a middle course between alternatives is always sought. In modern times the Third Way ➚ exemplifies this approach to politics. The yin-yang system can be applied to the history of dynasties, the initial phase is yang (violent and vigorous) and over the centuries transforms into yin (indolence and decadence) before its collapse. The harmonious mixture of alternatives inveigles its way into all things. In food, a meal must seek to balance yin and yang. Yin foods are cool and soothing (fruit; uncooked vegetables; bean-curd; sugar and green tea) while yang foods are the opposite: (chilli; ginger; beef and salt). The health of an individual was also considered to be controlled by the yin-yang system. Traditional Medicines sought to restore balance to the body by providing medicines with the appropriate proportion of yin and yang. Individual organs are labeled yin or yang, for example the liver is yin, so a disease of the liver is seen as caused by too much yang that has upset the balance. The upper half of the body, above the waist, is yang (including thought processes) and the lower half yin. The life force or ‘qi’ is believed to flow in channels within the body, half of these channels are regarded as yin, the other half yang so to treat an ailment with acupuncture needles are inserted in the appropriate channel to restore the yin-yang balance. Balance is also sought in Chinese garden design, hard, jagged rocks (yang) need to be used alongside water (yin) and the whole garden must seek a mixture of light/dark, hard/soft in texture and color. Citation information for this page : Chinasage, 'Yin and Yang', last updated 27 Mar 2018, Web, http://www.chinasage.info/yinyang.htm.